1 of 4 In a medium-size saucepan, combine 1-1/2 cups water, rice, cranberries and 1/2 teaspoon of the salt. Bring to a boil over high heat, stir once, then cover and reduce heat to medium-low. Cook 10 minutes, then add broccoli florets to pan. Re-cover and cook an additional 5 minutes. Remove from heat; let stand 10 minutes. 2 of 4 Meanwhile, combine remaining 1/4 teaspoon salt, the vinegar, mustard and honey in a measuring cup or bowl. Whisk in olive oil until blended. 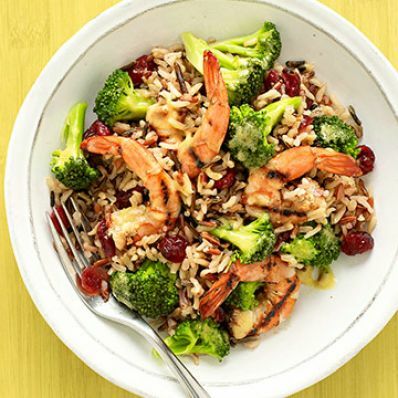 Place shrimp in a bowl. Add 2 tablespoons of the dressing and toss to coat. Toss remaining dressing with rice mixture in a large bowl. Refrigerate while heating grill and cooking shrimp. 3 of 4 Heat grill pan, grill or broiler. Grill or broil shrimp 4 minutes, turning once, or until cooked through. 4 of 4 To serve, spoon about 1 cup rice salad onto plate. Top with shrimp.